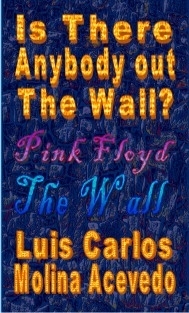 IS THERE ANYBODY OUT THE WALL is an analysis of the movie Pink Floyd The Wall. For this study, it is considered the film as revolving around two basic questions: Is there anybody out there and Is there anybody in there With the first starts this process of interpretation. And with the second ends this assay. It is considered, in addition, that the film is a mental machine to travel back in time. It consists of four levers: the real, memories, imagination, and desire. The first allows travelling in present time. The second allows travelling in past time. The third allows travelling in possible time, potential. And the fourth allows travelling in future time. Thanks Pink Floyd by make my life more bearable. In moments of disappointment toward the world, toward life, always I have returned to his songs. His high notes immediately have connected my nervous system with the cosmos, with the universe. Thanks for the spatial connection. For me, the screams of the vocal cords, to extend the duration of guitar notes beyond the usual, are the portal to cross the wall.